The RP Photonics Buyer's Guide contains 78 suppliers for lenses. An optical lens consists of a transparent medium (in most case an optical glass or polymer), where light enters on one side and exits on the opposite side. Often, but not always, it has at least one curved surface. Its purpose is to modify the wavefront curvature of the light, which implies that light is focused or defocused. Strictly speaking, a lens is always a single optical element, and this article treats mainly those. However, systems containing multiple lenses in a common housing are also often called lenses; we treat them in the article on objectives, or more specifically e.g. under photographic objectives. A collimated beam, having approximately flat wavefronts, is converted into a beam where the wavefronts are curved such that the beam converges to a focus. The lens then acts as a focusing lens – see Figure 1 (a). The same kind of lens can convert a diverging beam into a collimated beam; it then acts as a collimating lens. This can also be seen in Figure 1 (a) if you consider the incident beam to come from the right side. 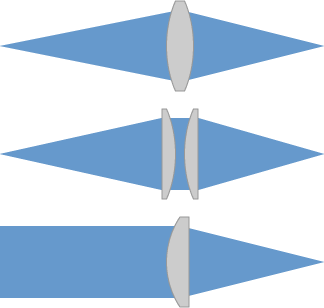 Other lenses, having concave surfaces, can make a collimated or convergent beam divergent – see Figure 1 (b). Such lenses could also be used to collimate a beam which is originally convergent. Frequently, a single lens or a combination of several lenses (an objective) is used for imaging purposes. For example, a camera objective is used for imaging a scene to a photographic film or an electronic image sensor. Similarly, microscope objectives are used for imaging small objects. Figure 1: Focusing and defocusing lenses. Although the change in beam radius is often regarded as a the actual function of a lens, its essential function is the change in wavefront curvature, which is the actual reason for changes in beam radius during propagation after the lens. (Note that the optical energy always propagates in a direction which is perpendicular to the wavefronts.) This is illustrated in Figure 2: Between the lens and the beam focus, the light converges because of the wavefront curvature, and after the focus it diverges due to the wavefront curvature in the opposite direction. Figure 2: Change of wavefront curvature at a focusing lens. The red and blue colors visualize the strength and sign of the electric field in one moment of time. The assumed wavelength is much larger than in reality. For most lenses, the produced wavefront changes arise from the curvature of at least one of the surfaces. For the typical biconvex lens (i.e., a lens with two convex surfaces) as seen in Figure 2, the optical phase delay for light getting through the lens near its center is larger than for light propagating further away from the center, where the lens is thinner. This is because the refractive index of the lens material is larger than that of the surrounding medium (normally air). The radially varying phase delay directly implies the change in curvature of the wavefronts. An alternative physical explanation is refraction at the lens surfaces. Particularly for thick lenses (see below), a detailed calculation based on refraction is more accurate than a calculation based on a radially varying phase delay, which ignores possible changes in beam size within the lens. There are also gradient-index lenses (GRIN lenses), where the refractive index systematically varies within the lens material. For a focusing GRIN lens, the refractive index is highest near the center and lower outside; there should be an approximately parabolic change in refractive index with increasing radial position. The surfaces of a GRIN lens are normally flat, so that it looks like an ordinary plate or (more often) like a cylindrical rod. The focal length f of a thin lens is the distance from the lens to a focus behind it, if the lens is hit by a collimated beam (see Figure 1 (a)). For a defocusing lens, the focal length is negative: it is minus the distance to the virtual focus (see Figure 1 (b)). For a thick lens (see below), the situation is more complicated. It generally has two principle planes, and the focal length for each side is the distance between that point and the corresponding focal point. If the medium surrounding the lens is the same on both sides, the two focal length values are identical. See the article on focal length for more details. The dioptric power (or focusing power) of a lens is the inverse of the focal length, or the refractive index of the surrounding medium divided by the focal length. Ordinary lenses as used in laser technology have focal lengths somewhere between 5 mm and many meters. Ball lenses and tiny aspheric lenses (see below) can easily be smaller, sometimes even well below 1 mm. This formula ignores the constant part of the phase change as well as aberrations. For more details, see the article on focal length. The curvature radii are taken positive for convex surfaces and negative for concave surfaces. The last term is relevant only for thick lenses (see below) with substantial curvature on both sides. The equation holds for paraxial rays, not too far from the symmetry axis, and assumes that the ambient medium has a refractive index close to 1 (as is the case for air). Note that different sign conventions are used in the literature. For example, a common convention takes the radius for the second interface as positive if the surface is concave. This is opposite to the convention used above. In many practical cases, a lens is so thin that the beam radius does not change appreciably within the lens. This is often the case for lenses with weak surface curvatures (i.e., large curvature radii). The third term in lensmaker's equation (see above) is then negligible, and by dropping it one obtains the simplified thin lens equation. There are many other equations in optics where simplified versions are available for thin lenses, or which hold only for thin lenses. The criteria for a lens being thin can be different in such equations. Thick lenses are often encountered when a large focusing power is required, and for compound lenses. The thickness d (the distance between the lens surfaces as measured on the axis) then also has a significant influence on the focal length, as can be seen in lensmaker's equation. Note also that the exact definition of the position of a thick lens, and thus also of its focal length, is not obvious for a thick lens, at least when it is asymmetric. where a is the distance from the original focus to the lens. This shows that b ≈ f if a >> f, but b > f otherwise. That relation can be intuitively understood: a focusing power 1 / a would be required to collimate the incident beam (i.e. to remove its beam divergence), so that only a focusing power 1 / f − 1 / a is left for focusing. If a ≤ f, the equation cannot be fulfilled: the lens can then not focus the beam. Note that the lens equation applies for rays, assuming that the paraxial approximation is valid, i.e., all angles relative to the beam axis remain small. The numerical aperture (NA) of a lens is defined as the sine of the angle of the marginal ray coming from the focal point, multiplied with the refractive index of the medium from which the input beam comes. The NA of a lens (and not its focal length) is what limits the size of a beam waist which can be formed with that lens. Lenses with rather high NA (of the order of 0.5 to 0.9) are required e.g. for players and recorders of data storage media such as CDs, DVDs and Blu-ray Discs. In a microscope, the NA limits the image resolution obtainable. High-NA lenses are also required for collimating laser beams which originate from small apertures. For example, this is the case for low-power single-mode laser diodes. When a lens with too low NA is used, the resulting collimated beam can be distorted (aberrated) or even truncated. Obviously, a high-NA lens has to be relatively large if it has a large focal length. The nominal numerical aperture of a lens may be smaller than what would be possible geometrically based on the open aperture, because operation in the very peripheral region may lead to excessive aberrations. For camera lenses (photographic objectives), a minimum f-number is often specified. For example, a f/4 lens is one where the maximum open aperture has a diameter of one quarter of the focal length. (Note that f, but not the f-number is the focal length!) This implies a numerical aperture of sin(1 / 4) ≈ 0.247. The focusing lenses shown in the figures above are all biconvex, i.e., convex on both sides. Plano-convex lenses are plane on one side and convex on the other one. Also, it is possible to make biconvex lenses with different curvature radii on both sides. Similarly, defocusing lenses can be biconcave or plano-concave. Figure 4: Different types of optical lenses. According to lensmaker's equation (see above), a certain dioptric power can be achieved with different lens designs. However, they differ in terms of aberrations (imaging errors, see below). For imaging a small spot to a spot of equal size, the symmetric biconvex lens is best suited. For an asymmetric application, such as focusing a collimating beam or collimating a strongly divergent beam, a plano-convex lens can be more appropriate. (The ideal solution would be an asymmetric lens with optimized curvature radii on both sides.) It should be oriented such that the curved surface is on the side of the collimated beam. Both lens surfaces then contribute to the focusing action. See Figure 5 for examples of typically used configurations. The exactly optimum configuration may e.g. slightly deviate from a plano-convex lens in the case was beam focusing, but the plano-convex solution is usually close enough. Figure 5: Recommended lens types for refocusing and collimation. The middle case for symmetric refocusing is better than the first one in terms of aberrations, but may have higher losses due to two additional optical surfaces. Meniscus lenses are convex–concave, i.e., convex on one side and concave on the other side. The contributions of both sides to the dioptric power cancel each other partially; overall the lens can be positive (focusing) or negative (defocusing). Meniscus lenses are often used as corrective lenses in objectives: their main function is to correct for image aberrations. They are also useful for condensers in illuminating systems. Ball lenses have the shape of a sphere. Doublet lenses are made by bonding two lenses together, which consist of different optical materials. Most common are achromatic doublets (see below). There are also Fresnel lenses, which can be made much thinner, but can hardly provide high optical performance. Most lenses have spherical surfaces, simply because these are the easiest to fabricate. However, a spherical surface more or less deviates from the ideal one, and this leads to image aberrations (particularly in peripheral regions) or to the deterioration of laser beam quality. These are called spherical aberrations. Aspheric lenses (see below) can have strongly reduced spherical aberrations. There are types of lenses with surface shapes which are optimized for certain applications. For incidence away from normal direction, one obtains astigmatism and coma. Also, lenses generally exhibit field curvature: focal points for incidence from different directions lie on a curve rather than a plane. Further, there are image distortions, e.g. in the form of barrel, pincushion or mustache distortions. Chromatic aberrations arise from the chromatic dispersion of the material from which the lens is made. A typical consequence is that the focal length is somewhat wavelength-dependent, so that white light cannot be perfectly focused: different wavelength components have their focus at different points. Achromatic lenses (see below) exhibit strongly reduced chromatic aberrations. When a laser beam with too large beam radius hits a lens, its beam profile can be truncated at the edges. This can lead to substantial beam distortions. Such aperture diffraction also occurs in imaging applications; the finite size of a lens can limit the image resolution of an optical system. However, the image quality is not necessarily limited by diffraction, if the used optical components and the optical design are not of a very high quality. Such imaging errors can often be substantially reduced either by optimizing single lenses or by suitably combining several lenses. This is the reason why photographic objectives, for example, usually consist of a substantial number of lenses. Although spherical aberrations can be largely compensated by suitably combining several lenses, it is sometimes preferable to use aspheric lenses, where the surface shape deviates from a spherical one. It is then possible to obtain a good imaging quality (with low spherical aberrations) already with a single lens, or with fewer lenses in an objective. However, aspheric lenses are more difficult to fabricate and thus more expensive. The most common approach for obtaining an achromatic lens, i.e., a lens with strongly reduced chromatic aberrations (see above), is to bond two lenses together, which consists of different materials (see the right side of Figure 4). For example, one can combine a low-index crown glass of biconvex shape with a high-index flint glass of plano-concave shape to obtain such an achromatic doublet. The curvature radii at the bonding interface are calculated for minimum chromatic dispersion, and must of course be precisely equal. It is possible to have the curvature of a lens surface only in the horizontal direction, for example, but not in the vertical direction. That cylindrical lens will then focus or defocus only in the horizontal direction while not affecting the wavefront curvature in the vertical direction. Cylindrical lenses can be used to obtain a beam focus of elliptical form, or to generate or compensate astigmatism of a beam or an optical system. If there is a curvature in both directions, but not of equal strength, one has an astigmatic lens. It can be used, for example, for vision correction. Figure 6: A photographic macro lens for combination with a standard objective. Collimating lenses are optimized for collimating e.g. the output of laser diodes. There are scanning lenses (e.g. in the form of f–theta lenses and telecentric lenses), made for laser scanners, where the beam focus is scanned along some line or over some area. However, scanning lenses are usually multiple element lenses (see below). Some lenses are used in combination with photographic objectives, e.g. for turning an objective into a macro objective (Figure 6). 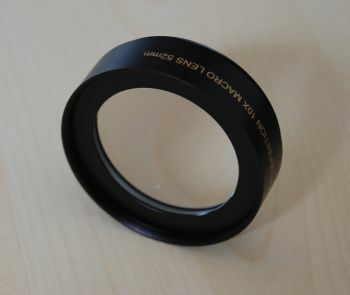 As lenses have only relatively few essential parameters (focal length, numerical aperture, suitable wavelength range), one frequently uses standard lenses, many of which are available from stock. However, one can also obtain custom lenses fabricated according to given specifications. For example, that way one can obtain lenses not only with unusual optical performance figures (e.g. aspheric lenses), but also with special geometrical features, optical materials etc. The single lenses can be either cemented together or mounted with some air space in between (air-spaced lens systems). In any case, the multiple element lens is used like a single optical element, e.g. as a photographic objective. Lenses are often produced from pre-fabricated lens blanks which are somewhat larger. With suitable grinding and polishing techniques, one removes part of the material to obtain the finally required shape and surface quality. Finally, one often applies an anti-reflection coating. After the process and frequently also during the fabrication process, sophisticated optical characterization techniques (e.g. involving interferometers) can be applied for monitoring fabrication errors which can e.g. result in wavefront errors. Many lenses have anti-reflection coatings on their surfaces, which substantially reduce the reflections caused by the refractive index change at the surface. Note, however, that this works only in a limited wavelength range. There is a trade-off between a high suppression of reflections and a broad operation bandwidth. There are also abrasion-resistant coatings, making lenses more robust. Lenses are commonly used as correction glasses, which can to some extent compensate visual impairments like myopia, hyperopia and astigmatism. Single lenses can be used for imaging applications, but multiple element lenses (objectives) are more common for such purposes. Examples are photographic objectives, microscope objectives, scanning lenses and projection objectives. In laser technology, lenses are often used for collimating or focusing of laser beams. Particularly for large diffraction-limited beams focused with high-NA lenses, the achieved focal spot sizes can be very small (potentially with a beam waist radius below 1 μm). Lenses can also be used for mode formation in laser resonators, although curved mirrors are more common for that purpose. Disadvantages of lenses, when comparing with curved mirrors, are the reflection losses and chromatic aberrations. On the other hand, they allow for tight focusing without astigmatism. Such considerations are also relevant, for example, when using lenses (or mirrors) for focusing ultrashort pulses of light.